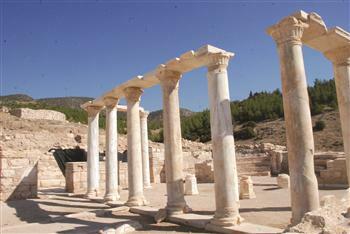 TURQUIE – Hierapolis - The ruined columns of a church in Denizli’s ancient city of Hierapolis have been rebuilt by an excavation team that has been leading a dig at the site for a number of years. The St. Philippus Church is home to the grave of Philip, one of the apostles of Jesus Christ. Works have continued this year in the church’s necropolis area, bath and basilica. The head of the excavation team, Professor Francesco D’Andria, said they had found a second church and a Roman grave during excavations in 2011. “Two of the 12 apostles of Jesus Christ are in Turkey. St. John is in Ephesus and St. Philippus is in Hierapolis. When St. Philippus came to Hierapolis to propagate Christianity in the first century, he was killed by the Romans there. At the time of the Byzantines, an altar was made on the place of his grave. Excavations around his grave revealed eight ruined columns, and we discovered a very nice church. The restoration project started last year with the support of the U.S. Kaplan Foundation. This year all columns were reattached and now they are open to visitors,” he said. D’Andria said one of the columns had a scripture in Greek, saying “God remember me,” written by Pontiff Theodosius in the sixth century. “It is a very interesting scripture because this is a faith center. It shows how people prayed to God in ancient ages,” he said. Excavations have been continuing at Hierapolis since 1957 under the direction of an Italian archaeological team. PAKISTAN – Swat - Pakistani hooligans have been urinating on the ancient rock carvings of Buddhist iconography dating from more than 2,000 years ago in the Swat Valley, archaeologists said. According to a report of the Archaeological Institute of America, the remains from the Gandhara civilization are under serious threat due to neglect on part of the government. The report revealed that the trespassers in the area have defaced the spectacular carvings in various ways, besides bad weather conditions, which have wreaked havoc on the remains over the years. The Gandhara civilisation flourished from the AD first to 11th centuries in northern Pakistan and eastern Afghanistan and is known for spreading Buddhism in the area, the report added. Minister for sports, tourism and archaeology of the Swat Valley, Mahmood Khan, however, said the government will soon devise a proper mechanism for the protection of all the archaeological sites of the Gandhara civilization in consultation with the experts and local culture activists. ROYAUME UNI – Towcester - The Roman wall discovered during the excavation process for the Moat Lane Regeneration Project has now been fully investigated and recorded by the county archaeologist and will be re-covered to preserve and protect it, whilst a final decision is made about its future. Councillor Rupert Fordham, portfolio holder for economic development and regeneration, said: “We have taken advice from English Heritage and other archaeological experts who say that at this stage we must cover up the Roman wall to protect it from the elements. Our primary concern, above all else, is that we ensure the integrity of the finding. The adverse weather conditions are having a detrimental affect on the stone so we have been advised to cover the wall in a special sand that will not react with the stone, thereby preserving it as it is. 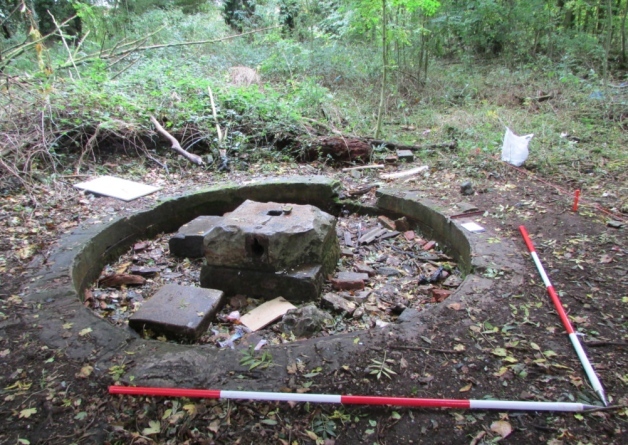 “We will shortly be meeting key local stakeholders to talk about the various options for the remains, and a decision on their long-term future will be made in the light of those discussions.”The re-filling of the site will be completed shortly, weather permitting, and is being carried out in accordance with the County Archaeologist’s Written Scheme of Investigation. Further discussions with representatives from the Towcester Museum, the Town Council and the Historical Society are due to take place to look at the various options. 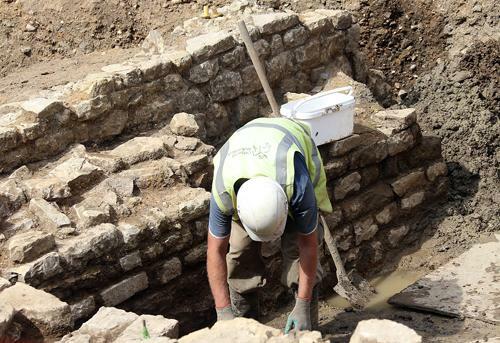 A final decision will be made based on advice from English Heritage and Cotswold Archaeology. ROYAUME UNI – Reffley - The West Norfolk and King’s Lynn Archaeology Society have uncovered evidence of the Reffley Brethren at an excavation in the remains of the old temple. During the summer, the society has been running a number of digs across the Gaywood Valley to learn more about the area’s heritage. The final digs were undertaken in Reffley, which has yielded proof of the secret society, which apparently still meets today. Society chairman Dr Clive Bond said: “The tableware, is porcelain, fine ware, including Willow-patten ware. This, and the pipes must relate to brethern meetings at the spring and in the building. They still smoke long clay pipes, part of the ritual at meetings and, of course drinking the distilled Reffley wine has always been important to meetings “In themselves, actually post-medieval pottery, clay pipes are not so unusual. But, importantly, this is at the temple site and we know meetings occurred over a few hundred years with ceremonies for a small group, a secret society. The place, the Reffley Brew and finding artefacts that must relate to these activities, is a unique insight into a distinct Lynn history.” The brethren was formed after the execution of King Charles I in 1649 to oppose Oliver Cromwell. Members would use natural iron-bearing springs in Reffley to make their secret punch and toast the Roman god of wine, Bacchus, within their octagonal temple. The temple was built in 1711 by the land owners, the Ffolkes family, and was guarded by sphinxes and contained an obelisk, which were both removed in the 1990s for safety reasons. At their meetings the brethren would traditionally eat a large joint of beef, saddle of mutton and a lobster salad. After, the society would smoke a secret blend of tobacco through huge clay pipes. Some of these pipes along with the coin were uncovered within the 30cm test pit dug by archaeologists at the temple on October 20 and 21. Dr Bond said: “The brethen may have been people of influence, power and somebody may have travelled. We don’t know how the coin got there, but, it could well relate to the meetings, or just be somebody visiting from an American air base. The date on the coin is not clear yet.” The society also uncovered some prehistoric flint flakes in two test pits on a footpath near Reffley Lane. Fifteen people took part in the dig, which was attended by Dr Mary Chester-Kadwell from Cambridge Community Heritage. MALTE – A new €2.49m research study, led by Queen’s University Belfast, is to help uncover Malta’s prehistoric past. The five year programme will examine the environmental and cultural background of prehistoric Malta. It will also develop strategies to ensure long-term conservation of vulnerable heritage in all island settings. Nineteen senior scholars from Queen’s, Cambridge University, the University of Malta, the Superintendence of Cultural Heritage and Heritage Malta are involved in the project. The project will allow researchers to reconstruct the changing ecology at different periods in Malta’s history by using ancient pollens and extracted tiny invertebrates including snails and insects. The analysis of these and other environmental and archaeological materials will take place in Queen’s specialist 14CHRONO lab. Other archaeological studies within the project will focus on landscapes and the remains of the ancient population. 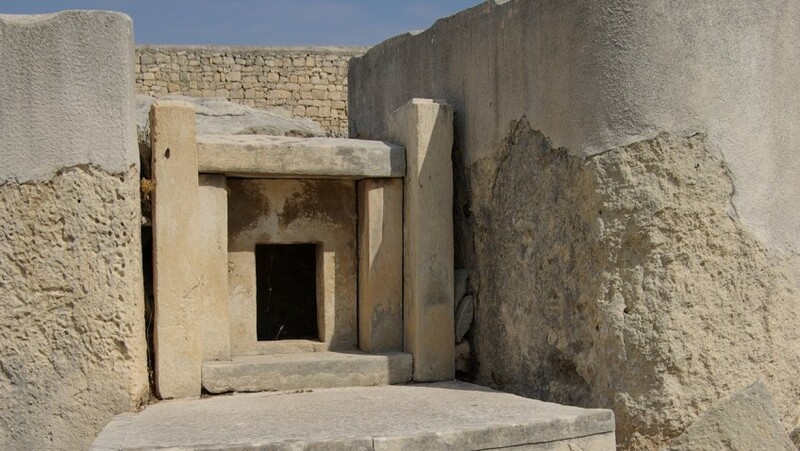 Researchers will study sites and settlements of the early Maltese to assess how the prehistoric people developed the socio-cultural resilience that sustained them during hard times. They hope examination of the early economy may identify changes in farming systems, while analysis of human bones will reveal diet, disease and population structure of the ancient Maltese.